As you read news headlines and listen to and watch media reports on the market, it's important to recognize that language may have different meanings depending on your perspective. Just last week the media reported that J.C. Penney stock "soared" 11 percent—on the surface that seems to be a positive enough development. While "soaring" is certainly more positive than "plunging," soaring suggests good news at J.C. Penney and for most investors this is how they will take the headline. Those investors will not look below the surface for the complete story. This is wild. Bilious WaPo blogger Jennifer Rubin lashes out at “jerk” Sen. Ted Cruz, says he must apologize to GOP colleagues. And the popcorn shall passeth. Four days ago, I had never even heard of "ramps" (in the sense of a vegetable), but on Friday the 26th, I had a great revelation. That morning I went up to the Swarthmore COOP to replenish my larder, which had been pretty much emptied out before I left on a trip to Kyrgyzstan and Turkey. Right while I was standing in the produce section contemplating whether to buy kale, baby bok choi, broccoli, spinach, asparagus, or some other vegetable, a lanky Irishman (I could tell from his accent) brought in two big bags of greens, the likes of which I'd never seen before. Why plural days and nights in Spanish greetings? R.R. points out that many European languages have a greeting that means "good day" — German "guten tag", Dutch "goeden dag", Swedish "god dag", French "bonjour", Italian "buon giorno", Portuguese "bom dia", Catalan "bon dia", etc. — and asks why (only?) in Spanish, the corresponding phrase is plural: "buenos dias". And also "buenas noches", "buenas tardes". Subversion at the spam factory? In his most memorable songs, all the pleasures of a down-home Saturday night couldn’t free him from private pain. His up-tempo songs had undercurrents of solitude, and the ballads that became his specialty were suffused with stoic desolation. The court has been releasing audio during the same week as arguments only since 2010. Before that, audio from one term generally wasn't available until the beginning of the next term. But the court has been recording its arguments for nearly 60 years, at first only for the use of the justices and their law clerks, and eventually also for researchers at the National Archives, who could hear — but couldn't duplicate — the tapes. As a result, until the 1990s, few in the public had ever heard recordings of the justices at work. But as of just a few weeks ago, all of the archived historical audio — which dates back to 1955 — has been digitized, and almost all of those cases can now be heard and explored at an online archive called the Oyez Project. Comment spam follows a formula, which was made plain the other day when a spambot accidentally posted its entire template on the blog of programmer Scott Hanselman. 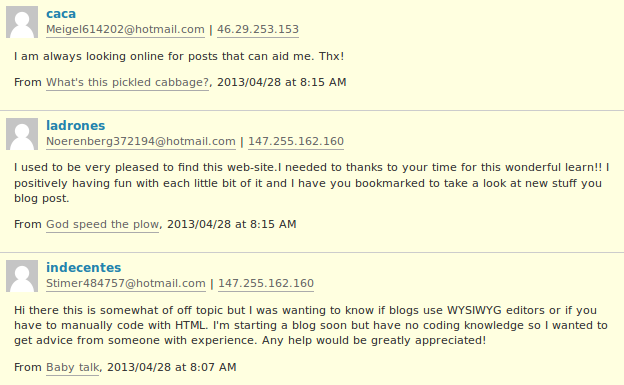 With his permission, we’ve reproduced some of the spam comment recipes here and added colorful formatting to make it readable. The spambot constructs new, vaguely unique comments by selecting from each set of options. We hope you find it wonderful | terrific | brilliant | amazing | great | excellent | fantastic | outstanding | superb. An article on Thursday about Caroline Shaw, who won the Pulitzer Prize for music this week, referred incorrectly to a vocal technique explored by a group she has sung with, Roomful of Teeth. It is Tuvan throat singing — a tradition of the Tuvan people of Siberia — not “tooth and throat” singing. 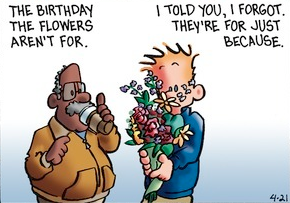 David Craig points out an interesting usage in today's Frazz: "They're for just because." As the Frazz example illustrates, you can also use a similar process to make noun phrases, though I think it's much less common.